Mandarin is also referred to as standard Chinese and the term "Chinese" usually also refers to this dialect. In Mainland China, Mandarin is the language of use in business, education and in many areas also in daily life. However, Mandarin is not just spoken in Mainland China. It is also official language in Taiwan and Singapore and is becoming more and more important in Hong Kong and Macao. In Chinese communities around the world, Mandarin along with Cantonese are the most common dialects spoken among Chinese immigrants. Although it can be said, that Mandarin is now spoken in most parts of Mainland China, there are still an infinite amount of accents. Thereby it is important to distinguish between dialects and accents. 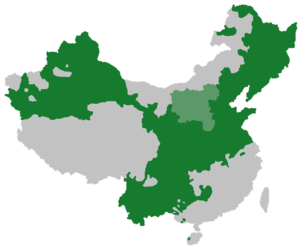 Dialects like Shanghainese or Cantonese are often languages differing from Mandarin in grammar and vocabular as well as pronounciation. Accents, on the other hand, mainly differ in that the pronounciation is not that accurate. However, the borders between accents and dialects are only existing theoretically, something you will realize if you are able to speak Mandarin and travel to Shanghai, Guangzhou or even Beijing. Although people will be speaking Mandarin, it might sound more like a different language as they mix up their dialect with Mandarin. This is interesting, because it is the same everywhere in Mainland China and Singapore - but, it is not for example in Taiwan. Mainland China and Singapore are using the simplified form of Chinese characters (also used in the Mandarin section on WoHok.com), wheras other countries use traditional ones. Especially when it comes to writing, for people with no prior knowledge of characters, simplified characters are a lot easier to learn as the characters contain fewer strokes. Well, learning Mandarin is tricky. The first thing people come up with, of course, are characters, but that's just a matter of studying, the more you study the more you know and the easier it will get. The 4 tones as well as some ways of pronounciation seem easy in the beginning but proof to become more and more difficult, especially tones. And this is the same with grammar, it is very simple in the beginning, especially compared to English or German, but the lack of real, binding grammar rules makes learning the language perfectly a lot more difficult on the long term. Nevertheless, the difficulty is just one more reason to study this language, if it was easy, everybody could do it. HSK stands for HanYu ShuiPing KaoShi - meaning Mandarin Level Test. There is an old version with over 7000 words and a new one with exactly 5000 words. This webiste will use the vocabularies of the new HSK Test as basis for teaching you Mandarin, this way you learn the language and directly get prepared for taking the tests allowing you to proof that you can speak Mandarin.